William (Bill) Raymond Swecker, 84, of Harrisonburg, passed away Wednesday, October 17, 2018 at Sentara RMH Medical Center. Bill was born in Charleston, West Virginia on January 5, 1934, the son of the late Jessie S. (Simpson) and Odes Elwood Swecker. Bill graduated from Morris Harvey College (University of Charleston) and attended West Virginia University College of Law. 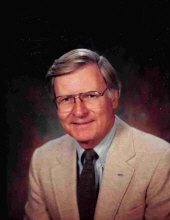 He worked as the Director of Planned Giving at Bridgewater College, and retired in 1996. He was a former president of the Bridgewater/Dayton Lions Club, was on the board of directors for the Harrisonburg/Rockingham Chamber of Commerce, and was the publicity co-chair for the town of Bridgewater’s Sesquicentennial Celebration. He had a love of adventure and was an amateur pilot. He started sky diving at the age of 62. He also loved history, especially that of the Civil War, the Shenandoah Valley and the Town of Bridgewater. He was a big fan of the Harrisonburg Turks, and served 20 years on the board and as assistant manager, assisting owners Jim Lineweaver and then Bob Wease. Bill is survived by longtime companion, Nancy C. Bryant of Harrisonburg; special cousin, Jerry W. Swecker and wife Linda of Bridgewater; daughter, Elizabeth J Timmons and husband John, of Fredricksburg; sons, Mark Steven Swecker and wife Terry, of Hurricane, WV and Adam Jason Swecker, of Pittsburg, PA; grandchildren Bryce Swecker and wife Felicia, Jett Swecker and Michael Swecker. Numerous cousins also survive. Per Bills request he was cremated and a celebration of life will be held at a later date. In lieu of flowers, memorial contributions may be made to Bridgewater College 402 East College St., P.O. Box 33 Bridgewater, VA 22812. To send flowers or a remembrance gift to the family of William Raymond Swecker, please visit our Tribute Store. "Email Address" would like to share the life celebration of William Raymond Swecker. Click on the "link" to go to share a favorite memory or leave a condolence message for the family.